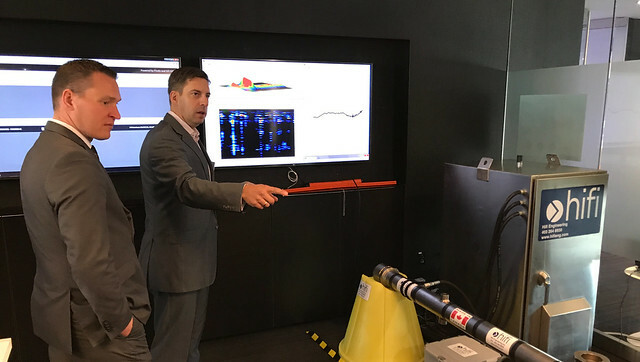 A Calgary start up is revolutionizing pipeline safety and expects to double its workforce over the next three years with support from the Alberta Small Business Innovation and Research Initiative (ASBIRI) at Alberta Innovates. The ASBIRI program supports local small businesses in the early stages of commercializing new technology, by supporting major real-world technology demonstrations. Hifi Engineering, a Calgary start up, plans to grow their business by building and manufacturing new leak detection technology in Alberta and exporting their product to monitor thousands of kilometers of pipeline worldwide. Through the ASBIRI program, they are beginning that expansion at TransCanada Corp., Enbridge Inc. and GE Canada, and anticipate a significant increase in future work on new and retrofitted pipelines. Hifi’s patented High Fidelity Dynamic Sensing (HDS™) technology will be used to detect various events and leaks with dramatically higher sensitivity than existing leak detection systems can provide – saving oil-and-gas companies money and protecting the environment. Testing locations include both ends of the Keystone pipeline, which will run from Hardisty, Alberta to Houston, Texas, as well as Enbridge’s new Norlite pipeline, which went into service this year. Alberta Innovates invested $2.4 million into the project. The investment from industry partners totals $7.3 million, with a specific requirement for industry to contribute approximately 25 per cent from the design stage onward. ASBIRI is administered by Alberta Innovates, a provincially funded corporation. Alberta Innovates’ mandate is to deliver solutions by building on our province’s research and technology development strengths in the core sectors of health, environment, energy, food and fibre, and platforms such as artificial intelligence and nanotechnology.